Let us explain! 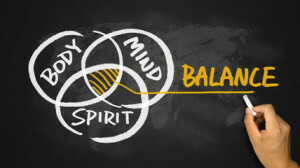 The four areas of well-being are physical, mental, emotional and spiritual. In the next four blog posts, we are going to write about how one of each of these well-being areas relates to the harp. First, we’ll explore physical well-being. An old mindset of yesteryear is it’s OK for musicians to “trash” their bodies. Where does this come from? While we aren’t sure of the origins of this old belief, we know this isn’t true today, especially with harpists. As a group, we spend a lot of time understanding the physical nature of both the instrument and the player’s body. Perhaps it is because the harp is a very physical instrument – both our posture and holding our arms up for extended periods of time, not to mention carrying it around! The main center of the body is the pelvis; important to ground and relax the pelvic/hip area. The back “drives” the body. Everything falls forward – our head, shoulders, hips, etc. and this “throws out” the back. A gentle exercise is to move the shoulder blades in and down. This opens the heart and the heart meets the harp at the thymus, which is the organ of the immune system. Breathing is vital. Unlike a woodwinds or brass instrument, we don’t actually have to breathe while playing the harp. Breathing contributes to the overall health of the player/performer and it nurtures, sustains, cleans out our bodies and opens the chest. Breathing also helps with anxiety. We may have a habit of holding our breath or not breathing deeply. It can be helpful to breathe oxygen into our fingertips, even visualizing our fingers are breathing. And finally, while the harp is all about helping people get rid of tension, the harpist must focus on this within themselves to help others. If we hold our breath, we create tension in our bodies (another reason it’s important to breathe!!). When the performers’ tension and the strings’ tension are released, we are one and heart-centered, giving to our audience/client/patient. So, yes the harp is a very physical instrument and taking care of our physical health is vital to our long-term thriving with this magical instrument. Next blog post will be about emotional well-being.